When it comes to biodiversity, Uganda is among the world’s most fortunate countries. It claims 10 percent of the world’s bird species (more than 1,000) and more than 340 species of mammals, including the elephant and the endangered mountain gorilla. Though poaching and bushmeat hunting are controlled in national parks and reserves, species loss persists in the acres of community land outside protected areas, as more people settle close to these biodiversity-rich regions. African Wildlife Foundation has identified four landscapes of high biodiversity value in Uganda, forming partnerships between the U.S. Agency for International Development, Uganda Wildlife Authority, and National Forest Authority to meet critical conservation and development targets. The most recent USAID-funded program to protect wildlife and wild lands while benefiting communities achieved powerful impacts. Apart from improving protected area management and ecological monitoring, our interventions have helped reduce human pressure on wildlife. We have introduced beekeeping to create economic alternatives for forest communities as well as chili farming — a natural income-generating solution that also deters elephants from raiding crops — to boost agricultural resilience. 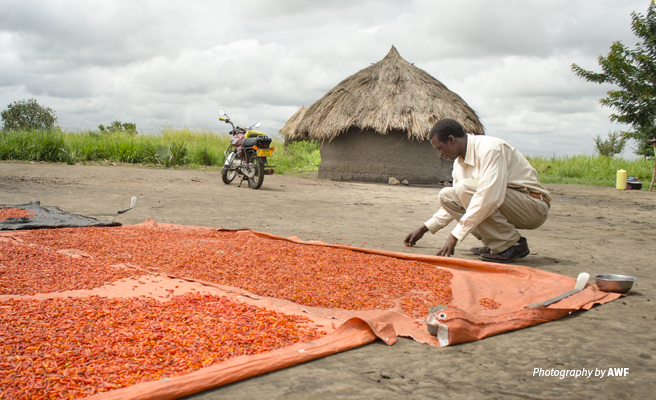 In Murchison Falls National Park, Uganda’s largest protected area and one of AWF’s priority landscapes, chili peppers are bringing prosperity to the landscape’s troubled farmers. Displaced after civil conflict and frequent incursions by rebel groups in 2007-8, people returning to their homes near the national park frequently encounter elephants roaming freely into the once-abandoned community land. As farmers begin to rebuild their lives develop their farms and, crop-raiding elephants are compromising livelihoods. The elephants are also at risk of retaliatory killings as farmers try to protect their farms and homesteads from further destruction. Chili peppers are a simple and cost-effective solution. When compacted in blocks or mixed with rice husks or cow dung and burned, the chili’s pungent smell repels most wildlife, including elephants. Chili has the same effect when mixed with oil and smeared on strings or rugs hung on garden edges. Chilies also repel elephants when planted in or around gardens so farmers reap more due to reduced attacks from elephants but also sell the chili to diversify their income. 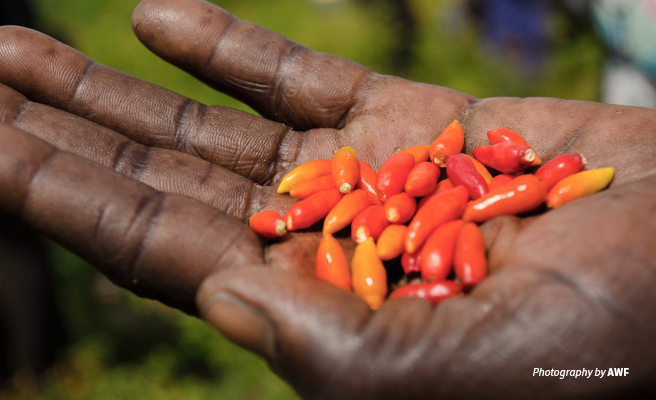 AWF is supporting communities around the northern and eastern edges of Murchison Falls National Park to scale up and transform this natural solution into a sustainable chili growing enterprise. Providing seeds, farming extension services, chili agronomy training and providing market linkages is just one aspect of addressing problem animal control and improving local livelihoods. Our community outreach also delivers training in wildlife conflict mitigation strategies and conservation education. With diversified incomes, communities are more economically resilient. Many are now able to educate their children, and over time they reinvest their improved earnings by purchasing livestock, farming equipment or construction materials. George Oyuru, an AWF-trained farmer who started growing chili on a one-acre plot in 2015, had doubled production within a year. The profits from chili farming allowed him to construct a 3-bedroom permanent house complete with a 10-watt solar power system, and buy a motorcycle. George can now pay school fees for his three children and recently got married. Apart from inspiring other farmers in the landscape with his success, George plays an important role in identifying competitive markets as a broker between his fellow chili producers and export companies like AgriExim and the North East Chili Producers Association. Since introducing chili growing in January 2015, AWF has helped establish 12 farmer groups, engaging more than 400 people around Murchison Falls National Park. Some groups have set up chili nurseries, and others have started a savings scheme by pooling their funds and providing loans within the group. Together, they can buy chilies from other groups and identify new exporters for their products while also training more farmers to adopt chili farming. A bumper yield between 2016-2018 drastically improved earnings for most farmers — over 12,664 kg of chili was harvested and fetched just over US $29,000. In addition to empowering communities through conservation-friendly microenterprises like chili farming and beekeeping, we bring benefits to the people who share land with wildlife by involving them in land-use planning, primary education, and eco-tourism. Drawing on AWF’s experience in increasing land under conservation, our work in Murchison Falls National Park involves establishing community conservancies north of the protected area. Securing this network of wildlife dispersal zones and corridors has the potential to link wildlife populations in Murchison Falls with a reserve further north, ensuring long-term survival. 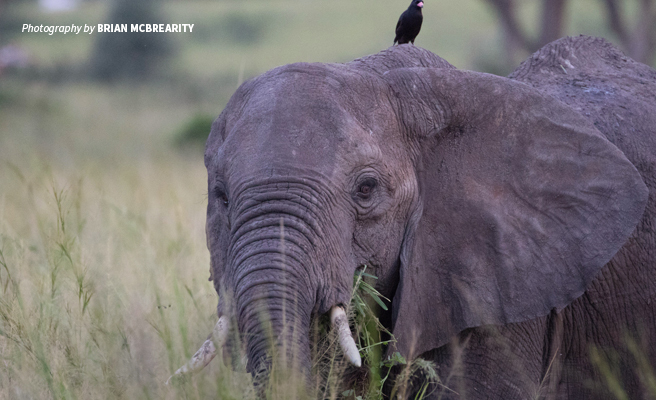 With the right investment, protecting wildlife assets can help generate tourism revenue for community members who dedicate land to protect wildlife corridors. Our successful partnerships with private companies are achieving conservation-friendly land management, enabling wildlife to exist and communities to benefit through employment in tourist facilities and revenue sharing. Methodius Mukhwana is African Wildlife Foundation’s Program Officer in Uganda, overseeing field implementation of conservation projects. He is interested in combining theoretical and practical experience to develop collaborative models for sustainable natural resource management to improve community livelihoods. Methodius also has a background in tourism and environmental sciences. He strives to share innovative conservation solutions with the scientific community through applicable geographical models and publications.